Meredith is often named as the first football superstar, he had the attitude of a Cantona combined with the playing style reminiscent of a George Best or Ryan Giggs. His bursts of speed and mazy runs down the wing coupled with his deadly crosses earned him the title the "Welsh Wizard" and made him the undoubted star of the team and a hero with fans. Meredith was also nicknamed "Old Skinny" for his lean, slim, frame. Everything was going so well then in 1905 a bribery scandal erupted - the FA accused him of bribing an Aston Villa player. 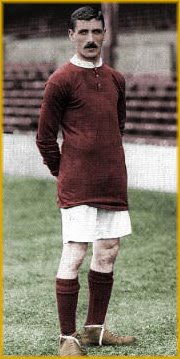 Meredith denied the charge but the Football Association banned him for 18 months along with other City players. The scandal was to play a critical role in the development of Manchester United. Questions were asked whether Meredith could regain his touch after his personal problems and such a long lay off about the player's, these questions were answered on his debut against Aston Villa. Meredith dazzled and tourmented the Villa defense all afternoon, finally pllaying the killer cross for Turnball to tutn into the net. i added ur blog in link in my blog. When Wayne Rooney introduced himself to the football world with his winning goal against Arsenal in 2002, he found a place in the hearts of all Everton fans. These supporters sat enthralled as one of their very own set the game on fire with his performances for both club and country over the coming years. An awe inspiring Euro 2004 swiftly followed. The aftermath of this tournament saw the man who famously wore a t-shirt saying “once a blue, always a blue” swap the colours of his boyhood team for the red of North Westrivals Manchester United. A betrayal like this was an unforgiveable act. The return of Rooney to his spiritual home this weekend should ignite this hatred once again. However, the defending champions are also seeing signs within their own ranks that the Red’s latest signing is beginning to set the United front line alight. Dimitar Berbatov’s double against Celtic took his tally to five goals in four games to prove that he should easily shoot up the scoring charts by the end of the campaign. It’s scary to think that there is still plenty more to come. The Bulgarian has slowly eased himself in to life in the fast lane, creating mixed feelings amongst the Old Trafford faithful. His languid style has certainly taken some getting used to after they were treated to the all action approach of Argentinean dynamo Carlos Tevez last season. The ex-Bayer Leverkusen man will need to continue to improve on Saturday afternoon if he is to provide Wayne Rooney with the support he’ll need to quieten the baying masses of the Goodison Park crowd. The visit of high scoring Premier League champions Manchester United toGoodison Park this weekend would probably have been the last thing that David Moyes would have wanted. The Everton manager has been left searching for answers since the start of the season as to why the team that has done so well over the last few years has begun to leak goals with such regularity. This poor start has seen the Toffees net bulge 18 times along the way to obtaining the worst defensive record in the division. Many Everton fans argue that this problem has stemmed from Lee Carsley’s exit from the club. The Irish enforcer added steel to a midfield that has sorely missed his influence since his move to Championship pace setters Birmingham City in the summer. Big money signing Marouane Fellaini has certainly not offered the cover that Carsley provided to the Everton defence, whilst Ecuadorian player Segundo Castillo has yet to impress. Tim Cahill’s enforced absence due to the suspension he picked up in the derby against Liverpool has also not helped matters. Moyes’ lightweight midfield has left his defence sorely exposed. Top performers of last year Phil Jagielka and Joleon Lescott have been visibly out of sorts. This has led to American goalkeeper Tim Howard being beaten between his sticks at an alarming rate. All this sees Everton in 16th place in the table, a long way from the Champions League positions they were supposed to be in the mix for. The Toffees did manage to stifle Arsenal’s electric attack until the second half of last weekend’s match at the Emirates. But Moyes must now try to build on this performance so that he can get his team on the right track. The Toffees centre back Joseph Yobo is expected to return to the first team after overcoming the virus which kept him out of the trip to the Emirates. Yobo may be joined by Victor Anichebe (hamstring) and Segundo Castillo (hamstring). Lars Jacobsen (shoulder) is definitely ruled out, whilst Tim Cahill will serve the last game of his suspension. Last starting XI (vs. Arsenal): Howard, Hibbert (Vaughan 80), Jagielka, Lescott, Baines, Arteta, Osman, Rodwell, Fellaini (Saha 74), Pienaar, Yakubu (Neville 80). Subs Not Used: Nash, Nuno Valente, Gosling, Wallace. Squad: Howard, Nash, Nuno Valente, Yobo, Hibbert, Jagielka, Lescott, Baines, Gosling, Wallace, Neville, Arteta, Castillo, Osman, Rodwell, Fellaini, Saha, Pienaar, Vaughan, Anichebe, Yakubu. Rio Ferdinand (groin) and Patrice Evra (hamstring) are expected to rejoin the United backline after missing the mid week massacre of Celtic. In worse news, Michael Carrick (ankle) and Owen Hargreaves (knee) are yet to shake off the niggling injuries which have kept them out of the first team for the last month. Paul Scholes (knee) is out until the new year. Last starting XI (vs. Celtic): Van Der Sar, Neville (Brown 59), Evans, Vidic, O'Shea, Ronaldo (Park 82), Fletcher, Anderson, Nani, Berbatov (Tevez 60), Rooney. Squad: Van Der Sar, Kuszczak, Foster, Evra, Ferdinand, Neville, Brown, Evans, Vidic, O'Shea, Rafael Da Silva, Gibson, Ronaldo, Park, Fletcher, Anderson, Nani, Giggs, Berbatov, Tevez, Manucho, Welbeck, Rooney. Eyebrows were raised when Joleon Lescott was named in the recentEngland squad. The ex-Wolves man has been in a terrible run of form, with David Moyes even leaving him on the bench for Everton's last home match against Newcastle United. Lescott was re-called for the trip to Arsenal by his manager, in a game where he showed glimpses of the stellar performances he put in last season. He must improve on this once again with Rooney, Berbatov and co. ready to pounce on any mistakes. This isn’t the most pleasant of homecomings for former Everton idolWayne Rooney. The Goodison crowd have never forgiven him for the ‘betrayal’ of his boyhood club in 2004, and they certainly do not keep quiet about their feelings. Rooney is made of solid stuff however, and is more than happy to give as good as he gets. The England international is also sitting on 99 club goals. Will he bring the 100 up back where it all started in 2002? The one thing you don’t want to have when Manchester United come swinging in to town is a shaky defence. Unfortunately for Everton, they have this very problem. To add insult to injury, United’s strikers are also in red hot form, ready to take advantage of this weakness. All this means that you can expect plenty of headaches for David Moyes and a convincing win for the Premier League champions come Saturday afternoon.